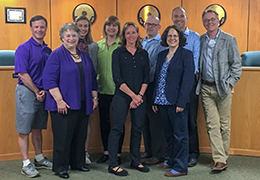 Each month the Glen Ellyn Park District review the district’s volunteers and participants to find those who best exemplify the interests of the park district. 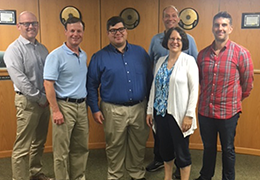 These people are then recognized as the Best of Glen Ellyn at a Park Board meeting. If you would like to nominate someone for this award, email support@gepark.org with your nomination and details. 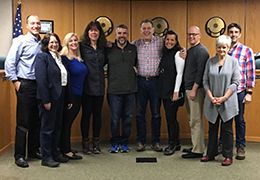 The Glen Ellyn Park District Board of Commissioners recognized the following volunteers who served selflessly for over five years on the Glen Ellyn Gator Parent Committee: Paula Barnett, Gina Walch, Kim Welsh, Tina Hutchinson, Dave Short, Dominick Ficarella, Rob Pieper, and Sarah Mical. The leadership, dedication, commitment and enthusiasm of these individuals for the sport of swimming is one of the biggest reasons for the continued success and growth of the program. In coordination with his foundation, Charlie’s Corner, Brendan collaborated with the Glen Ellyn Park District to introduce a new event in 2017: Glow in the Park Lantern Walk. A benefit for Ann & Robert H. Lurie Children’s Hospital of Chicago, the event raised over $8,000 which was donated to the Neonatal Intensive Care Unit at Lurie Children’s. 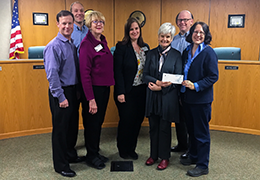 The Glen Ellyn Park District Board of Commissioners recognized Dawn Smith, Steve Thompson, and the Glen Ellyn Chamber of Commerce for their continued partnership in organizing and staging the 3rd annual Chocolate, Cheese and Wine event. The Chocolate, Cheese and Wine event is a combined fundraiser for the Glen Ellyn Chamber of Commerce and the Glen Ellyn Park District. Funds received from the event are split among the two agencies each year. In 2018, due to its successful turn out of participants and numerous sponsors, the event raised $2,000 for the Park District with the funds earmarked for the scholarship program which enable residents in need to receive financial assistance for Park District programs and activities. The Glen Ellyn Park District Board of Commissioners recognized the hard work, long time service and dedication of the following front desk staff: Maureen Ray, Shanda Cotter, and Rebecca Karales. With over 20 years of service working at the three recreation centers, Ackerman Sports and Fitness, Main Street and Spring Avenue, these loyal front office staff employees are critical to the everyday operations of the centers. 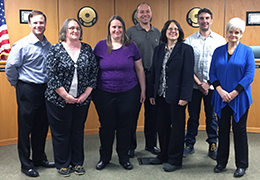 The Park District Board of Commissioners acknowledged John Bower, Gail & Amber Bode, Kathy Cornell (Board Liaison), Adam Kreuzer, Carrie O’Halloran and Diane Padilla for their dedication and tremendous help in making Earth Day 2018 such a success! 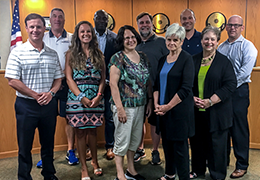 The Glen Ellyn Park District Board of Commissioners recognized the following individuals who assisted in a life saving event at the Ackerman Sports and Fitness Center including staff members: Myron Yocum, Stacey Lim, and Pete Heinrich, as well as Bola Akinlawon and Maurice Velasco who were part of the soccer group where the incident occurred. Through the quick and selfless actions of staff and participants, the victim’s life was saved. The Park District is extremely proud of the staff who acted immediately with competence, calmness and decisiveness. 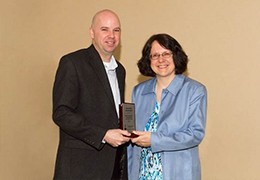 The Park District Board recognized Adam Baldocchi and Kathleen Taback (not pictured) for the great honor of receiving the Golden Guard Award from Ellis & Associates. Ellis & Associates is an international aquatic safety and risk management firm dedicated to the prevention and elimination of drowning and other catastrophic aquatic events. This coveted achievement is reserved for those individuals observed performing their normal job duties while exhibiting behaviors that surpass the expectations of all safety standards in the areas such as swimmer surveillance, professionalism and vigilance. Only about 1% of the thousands of aquatic personnel evaluated at Ellis & Associates client facilities receive this honor annually! 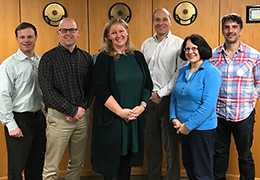 The Park District Board recognized Deborah Cernich for her dedication and volunteerism to the Golden Eagles Cheerleading program on Tuesday. Debby currently serves as the Golden Eagles Cheerleading Fundraising Committee Chair and as head coach of the Junior High cheer squad.